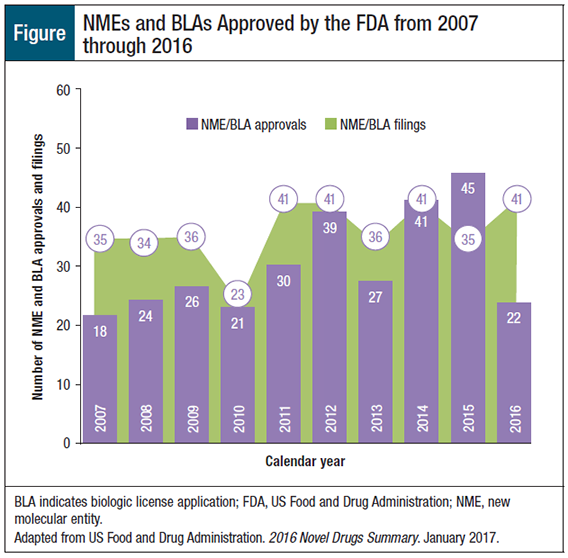 If 2015 marked a near-record year in the US Food and Drug Administration (FDA)’s approval of new drugs in the past decade, 2016 will go down in history as one of the years with the lowest number (22) of new molecular entities (NMEs) and new biologic license applications (BLAs) approved by the FDA. This rate is only slightly higher than the 21 novel NMEs and BLAs approved in 2010 and the 18 approved in 2007 (Figure). The stark difference from 2015, when 35 novel drugs were approved by the FDA, was not missed by anyone in the healthcare industry. Zinplava (bezlotoxumab): first human monoclonal antibody to reduce Clostridium difficile infection ­recurrence. Rare diseases continue to be a major driver in drug development for pharmaceutical companies and for the FDA, as is evidenced by the 9 (41%) new drugs approved by the agency in 2016 for rare conditions, including Anthim (for anthrax inhalation), Defitelio (for hepatic veno-occlusive disease), Exondys 51 (for Duchenne muscular dystrophy), Lartruvo (for soft-tissue sarcoma, a rare cancer), Netspot (to detect neuroendocrine tumors, a rare cancer), Ocaliva (for primary bilary cirrhosis), Rubraca (for rare type of ovarian cancer), Spinraza (for spinal muscular atrophy), and Venclexta (for chronic lymphocytic leukemia with 17p deletion). In many cases, these drugs represent the first-ever therapy available for patients with these rare diseases, which also accounts for the high drug price accompanying many of these new, and often life-saving, agents. Indeed, cost remains a major bone of contention related to innovation in drug therapy. Continuing the trend seen in recent years, the novel agents approved in 2016 were dominated by specialty drugs and by orphan drugs with new mechanisms of action for rare diseases. These factors also ensure that the trend of escalating drug costs will continue to dominate the discussion of drug therapy. The call to compare the benefits of new drugs with existing therapies, and the growing focus on value-based care, financial toxicity, and the need to assess the clinical innovation introduced by new drugs versus their economic burden, have all become part of the clinical discussion and have brought the patient into clinical decision-making. The growing share of biosimilars in the US market is expected to help mitigate some of the cost issues, although the FDA approval of biosimilars continues to lag behind expectations. In 2016, the FDA approved 3 new biosimilars, all are tumor necrosis factor-alpha (TNF-α) inhibitors indicated for multiple autoimmune conditions similar to their reference drugs. The first anti–TNF-α biosimilar, infliximab-dyyb (Inflectra), was approved by the FDA on April 5, 2016, as a biosimilar to its reference drug, Remicade; the second, etanercept-szzs (Erelzi), was approved by the FDA on August 30, 2016, as a biosimilar to Enbrel; and the third, adalimumab-atto (Amjevita), was approved on September 23, 2016, as a biosimilar to Humira. Although so far only 4 biosimilars have been approved by the FDA, because many biologics will be losing their patent protection in the next few years, it is reasonable to expect a vibrant market activity related to new biosimilars coming to market by 2020 and beyond. The FDA’s increasing tendency to expedite the drug approval process of novel drugs has led to the approvals of new medicines initially as breakthrough therapies, which requires follow-up testing and confirmatory evidence on the part of the drug manufacturer; other mechanisms include the FDA’s priority review and the accelerated approval processes. Together, these 3 tools in the FDA’s armamentarium help to expedite patient access to new therapies and introduce them to market. Overall, 15 (86%) of the new drugs were approved under the FDA’s priority review process, which is given to a drug when “CDER determines that the drug could potentially provide a significant advance in medical care.”2 Priority review shortens the approval period from the standard 10 months to 6 months or less from the time of an NDA filing. Furthermore, the FDA used its accelerated approval process to approve 6 (27%) drugs in 2016; this type of approval is based on a surrogate end point that is considered likely to demonstrate the drug’s clinical benefit, and requires the drug company to provide additional testing to confirm that benefit. Accelerated approval is used to expedite access to a drug deemed by the FDA to be of benefit for a serious or life-threatening condition. It is therefore not surprising that 4 (27%) of the 6 drugs approved under this process were for cancer, including Lartruvo, Rubraca, Tecentriq, and Venclexta. The other 2—Exondys 51 and Ocaliva—were for rare diseases. Cancer Drugs Top the List—and onto 2017? Cancer drugs took the prize in 2016, with the approval of 7 new drugs in oncology, followed by 4 drugs for infectious diseases, a reversal from previous years. In addition to accelerating the approval of new oncology drugs, an important trend seen clearly in 2016 was the FDA approval of multiple new and important indications for drugs already on the market, especially for new types of cancer. For example, Tecentriq was first approved in May 2016 for bladder cancer, and then in October 2016 for lung cancer. Many other cancer drugs received new indications for a different type of cancer, sometimes for several types of cancer. Judging from the new FDA approvals in early 2017, cancer drugs are positioned to continue to dominate the FDA approval process in the coming months. By mid-March, the FDA approved 2 novel cancer drugs as well as 4 new indications for cancer drugs already on the market. On February 28, 2017, the FDA approved telotristat ethyl (Xermelo), a tryptophan hydroxylase inhibitor, the first oral drug for patients with carcinoid syndrome diarrhea, a rare condition; on March 13, 2017, ribociclib (Kisqali), a CDK4/CDK6 inhibitor, was approved for the first-line treatment of metastatic breast cancer. As for new indications, on January 19, 2017, ibrutinib (Imbruvica) became the first nonchemotherapy drug to be approved for marginal zone lymphoma; on February 2, 2017, nivolumab (Opdivo) became the second treatment for bladder cancer approved in the past 12 months; on February 22, 2017, lenalidomide (Revlimid) was approved as maintenance therapy after autologous stem-cell transplantation; and on March 14, 2017, pembrolizumab (Key­truda) was approved for classical Hodgkin lymphoma. These newest approvals have important clinical implications for patients, payers, and providers. If this trend continues, 2017 may exceed its predecessor in FDA approvals of new drugs and in important new indications for existing drugs, especially in oncology. 1. US Food and Drug Administration. 2016 Novel Drugs Summary. January 2017. www.fda.gov/downloads/Drugs/DevelopmentApprovalProcess/DrugInnovation/UCM536693.pdf. Accessed March 10, 2017. 2. Jenkins JK. A review of CDER’s novel drug approvals for 2016 [Blog]. January 4, 2017. https://blogs.fda.gov/fdavoice/index.php/2017/01/a-review-of-cders-novel-drug-approvals-for-2016/. Accessed March 10, 2017. 3. Hirschler B. New drug approvals fall to six-year low in 2016. January 2, 2017. Reuters. www.reuters.com/article/us-pharmaceuticals-approvals-idUSKBN14M08R. Accessed March 10, 2017. 4. Jenkins JK; for the US Food and Drug Administration. CDER new drug review: 2016 update. December 14, 2016. www.fda.gov/downloads/AboutFDA/CentersOffices/OfficeofMedicalProductsandTobacco/CDER/UCM533192.pdf. Accessed March 10, 2017.